Shown with the Cessna airplane formerly owned by Bud Carroll, from left: Blake Westbrook, Earnie Duckworth and James Garrison. Duckworth and his employees recently painted the plane for the current owner. The return an old Cessna airplane to Fayette brought back fond memories for a few men who remember taking numerous rides with Bud Carroll, the former pilot and owner of the aircraft. Earnie Duckworth is an aircraft painter stationed at Richard Arthur Field in Fayette. 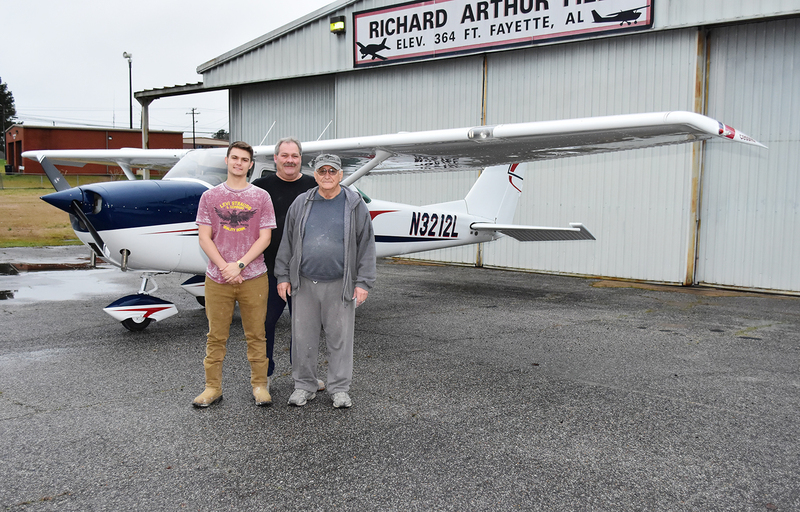 He said that a few months ago, he was contacted by the current owner of the plane, Blackstone Aviation in Hartselle, to do a total repaint of the aircraft. Duckworth said that he knew immediately when he heard the plane’s call letters that this was the plane that had started him on his love of airplanes.